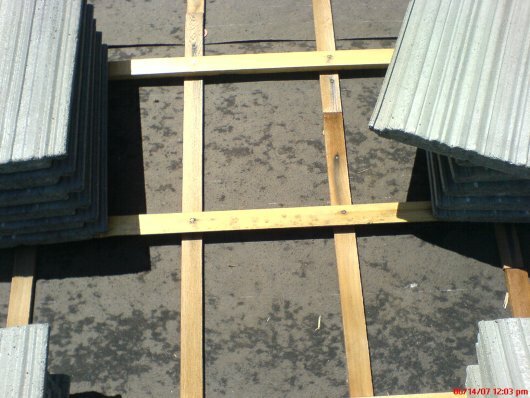 We have found many roofing installations where non-ASTM Numbered underlayments have been used. After further investigation, we found this problem is very widespread over the entire region and has been for years. Most roofing supply companies stock and distribute these non-ASTM Numbered Type II underlayments (commonly referred to as 30 pound base felts) and mineral-surfaced roll roofing (commonly referred to as 90 pound roll roofing) used for both an underlayment and as a valley liner. Chapter 15 of the IBC and Chapter 9 of the IRC both require the use of properly labeled ASTM Numbered Underlayments for all types of roofing. They also require properly labeled ASTM Numbered valley liners. They require the underlayments to meet this criteria for a reason. Roofing Contractors were telling us they could not get the proper ASTM Numbered mineral-surfaced roll roofing that they wanted to use for underlayment with their tile roof installations because none of the suppliers stocked it. We informed them they had to find an alternative. We then received a phone call from one of the major roofing manufacturer's representatives about this issue. I could tell he was amazed that I was writing a correction notice for this. He told me that for years they have been shipping this non-ASTM Numbered mineral-surfaced roll roofing to this area with no problems. After questioning him, I found that their company does indeed make properly labeled ASTM Numbered mineral-surfaced roll roofing but shipped it to other areas of the country, such as Florida. He then asked if roofers could still use his product for a valley liner. He did not like my answer. I asked him politely to stop shipping these inferior roofing products to this region. 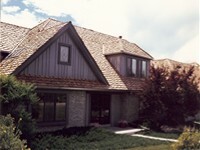 Colorado is no longer a dumping ground for inferior roofing materials. I also informed him that all Building Department Officials were going to be informed of this problem. Roofing Inspectors and Roofing Contractors, when you see Type II underlayments turning gray rapidly within a week or two, question if they are indeed properly labeled ASTM Numbered underlayments. You will also find that the non-ASTM Numbered Type II underlayment is a bit thinner and not as flexible and many times the underlayment has what looks like oil spots throughout. 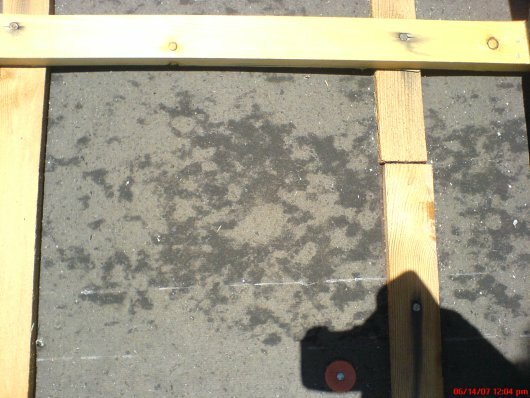 The best indicator of non-ASTM Numbered Type II underlayments is after a rain. The underlayment will show water marks for hours and sometimes a day or two later. I would guess this is because the saturation level of asphalt is below the standard to meet the ASTM Criteria. See Photos below. To verify that properly labeled ASTM Numbered underlayments are being used, go onto the roof and look at the labels on the rolls of underlayment they are using. If there are no rolls or there are no rolls with labels then pull a label from under the vertical seams of the underlayment and read it. When driving by a job where the roof is being dried in, stop and go onto the roof to verify that they are using the properly labeled ASTM Numbered underlayment. If we all start looking for this problem and word gets around, Colorado will stop being the dumping ground for some inferior roofing materials.